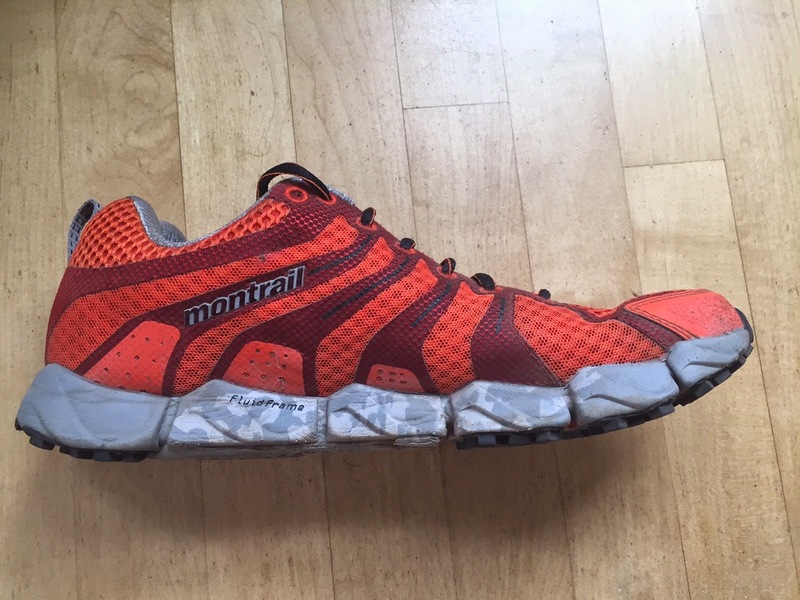 The Montrail FluidFlex ST is a 9.4 oz/ 266 gram 22mm heel/18mm forefoot trail runner with a stable supportive ride. $95, so a very good value compared to many 2015 trail runners. Lightweight and agile, the overall package has a substantial seamless upper, great rock protection and an innovative variable density midsole, the Fluid Frame. 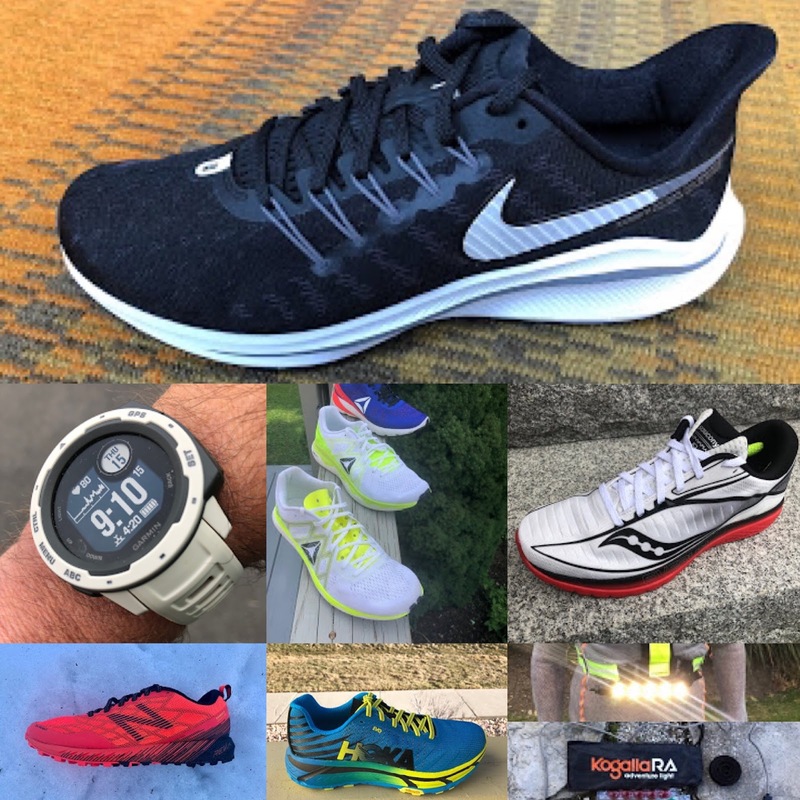 While the shoe is called out for "over pronators" this resolutely neutral runner, who can't stand stability and support features in most shoes, found the firmer mid foot midsole foam just right for rougher trail stability and confidence. I sized up half a size and fit is perfect. The special sauce in the FluidFlex ST is the midsole. So the result is a relatively soft heel (gray foam), firm supportive mid foot (white and gray foam) then softer under the forefoot protected by the rock plate (gray foam). The outsole is Montrail's Gryptonite sticky rubber arrayed in a Micro 3 Point Lug configuration. I find this arrangement a decent compromise for most terrain. The exposed midsole under the midsole is relatively firm and thus should be quite durable, but it is exposed. To achieve the sub 10 oz weight with supportive upper and stable midsole something had to go, outsole coverage, where it is not really needed. A deep flex groove under the ball of the foot makes the FluidFlex ST a decent climber despite the firm and stiff composite rock plate. The flex is a little strange and discontinuous as it goes from great flexibility at the ball of the foot to stiff under the plate and then more flexible up front by the toes. Not really noticeable on any terrain except maybe moderate uphills at speed where it feels a touch awkward. The upper is excellent. Very supportive, snug around the heel and mid foot with a narrower but in no way binding front of the shoe. 5 seamless overlays are tied into the laces. Where the dark red inverted Y overlays meet the midsole thicker overlays fill the gap in the same pattern on either side of the shoe. When the stable platform is combined with the upper I have felt well supported and confident, not always the case in a sub 10 oz trail shoe. Softer mesh over the toes is combined with denser more supportive mesh in the mid foot. The toe bumper is decently firm combing a sewn overlay with a coating of ground rubber but, unlike many trail shoes. the toe bumper is not noticeable on the run. Debris sneaking in has not been an issue. The tongue is decently padded but not overdone The heel collar is firm and well padded. Quite an improvement in upper stability when compared to the Montrail Bajada of a few years ago where the upper collapsed medially after relatively few miles. The Bajada II shares many of its upper characteristics with the Fluid Flex ST including a similar more robust upper. More miles will tell me if the upper remains solid but I believe it will. While billed as a trail runner with some pronation control, and I can't stand pronation control shoes, I have found the FluidFlex ST to be a stable, light, agile trail runner for just about any terrain and especially rougher terrain where the low slung platform really shines. It is also quite fine on the road, if a bit firm, making it a good door to trail shoe. It is very decently priced at $95. 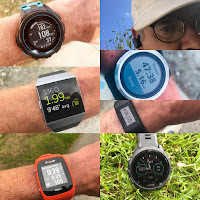 Never a fan of super light, super flexible trail runners, preferring more cushioning and stability the FluidFlex St may not be the shoe I run for really long runs on moderate terrain (Hoka Challenger ATR or Speedgoat, adidas Raven Boost) or fast runs on smooth terrain (adidas Adizero XT Boost) but for those in between distances on rougher terrain it is a fine blend of protection, agility, and stability all at less than 10oz weight. The FluidFlex ST were provided to me at no charge by Montrail. The opinions herein are entirely my own. The Montrail FluidFlex ST is available at Running Warehouse US, now: Men's here Women's here. FluidFlex ST is on sale for $66.50 (ends 6/14) . All purchases at these links support my blog. Thanks!